Ok, folks...I have the most magical story ever!!! So, settled in with a cup of chai (or coffee...or wine...or whatevs!) cuz this is life-changing for me, and it all began with ServiceSpace! I could go all the way back to reading about Nipun and Karma Kitchen in a "Energy for Dummies" type book, but that would get really long. So, I will start with the Awakin Call that I was blessed to be a part of in January. Audrey forwarded me an email from a woman named Grace (pictured in orange above) who said she would like to get in contact with me because she had also been sexually assaulted as a girl and perhaps I could help her move forward. Well, I was just blown away that a beautiful sister in Uganda felt like I could help, so I emailed her that day! that helps girls and women in Uganda who have been sexually assaulted, are suffering from HIV/AIDS, etc with so many vital services. I instantly connected with her and mailed her a copy of my book, Little Miss and Spirit Bear's Kiss, which is one piece of my own healing. Then I asked how else I could support her (just like a real ServiceSpacer would!!!). I told her I didn't have much, but I would love to send her some money. She gave me the info, I wired it, and that was that. BUT WAIT!!! It really wasn't! The next weekend I went to Banyan Grove and gushed all over Audrey and Nipun O Jhi (ya know...like OG) about how grateful I was to them for forwarding me Grace's original email. Truly, I will never be able to repay all the intangible gifts all of you have bestowed upon me on my journey! Just learning from you all and being inspired to bow more deeply into my service (What, what?! Look at me go with my phrases!) has changed my life. In the meantime, I was still emailing Grace daily and telling my husband, Sean, "I really think I am being called to Uganda." He was like, "Uh no. You're not going to Uganda." Keep in mind, this is the man who when we were getting together for our second marriage each had all kinds of doubts about moving to Marin, I told, "Don't worry! The Universe will provide." To which he replied, "I'm Catholic. We don't believe in that sh*t." :) Haha! But I really felt like I needed to go. Imagine my heart breaking when Grace emailed me saying they had received the funds I sent and the women and girls "kindly ask that I come visit because they feel I am already their mother." I mean...total gut punch, right?! I explained that Uganda was just so far and so much money, but I would put out to the Universe that I was being called to be there. And that was that. Think that's the end of the story? Not by a long shot! When Sean got to work to tell his colleagues about this incredible gift, they said they wanted to support him coming with me!!! He is a true servant to our veterans, helping them get benefits and the mental health they need, so trust me...it doesn't surprise me that he was offered this! And so we shared this with our families...and they wanted to support JJ coming!!! How is this my life?! How am I so blessed?! Well, I shared the story with my service students because it really is incredible and everything I try to teach them about recognizing that our greatest darkness can bring our most brilliant light. One girl was so moved that not only did she start a GoFundMe for Grace but she also convinced her mom to support Grace's organization through her own company, who will match any contributions they raise. Can you believe it?! All of this started so long ago, and I am blown away by the magnitude of what you all here have created for me. And it's not just me. This is trickling down to not only my student-kids, but my own kids as well. JJ turns 8 at the end of this month, and I told him I did not want anyone to bring gifts to his party. I just want to vomit at the amount of stuff he has (yes...I am to blame! ), and I really want to teach him that experiences are worth so much more than money. You may even say, experiential capital is more valuable than financial capital (What?! Did I just throw down a reference to 8 Forms of Capital?! Oh yes I did, honey!) Well, JJ thought about that and at first was not totally pleased, But then said, "Well then, can we have people donate to Grace as my gift?" I mean, does that just make you melt? So there it is...on his little birthday evite...a link to the GoFundMe. Sigh. Life is so beautiful, I cannot even handle it. So I emailed Grace. And we bought our tickets with a credit card Sean's people allowed us to use to secure them. And we are going at the beginning of August because in talking with Grace I discovered her organization is holding a women's event on August 3rd with as many women and girls who are struggling to find their own light to come and get services. And I will be there to hug them. And love them. And tell them how very worthy they are, something I am still learning about myself. ANd I will write a book about this whole experience and call it "Amazing Grace" for so many, many reasons. Ohhh WOW Melissa, I was on the edge of my seat with that story. And LOL'ing multiple times. :) (Nipun O Jhi, that's too good) But man, what a beautiful unfolding--that continues! Thank you for sharing in your wonderful Melissa way, and including so many others along on the journey. Yay, Melissa! Everything about this story makes me want to give you a million high-fives and a huge hug! How wonderful that your family gets to share in this magic. Safari njema! What an incredible series of events, thank you for sharing all of the details of this beautiful unfolding in only ways that you can -- I could hear your voice telling me this story right from the start all the way to the finish! :) And this must the the universe responding with all the love that you put out in the world both as a teacher and as a human being. Much love for the journey and safe travels to Uganda this summer! This as beautiful and touching as it is funny and passionate.. Sending all the good vibes out into the world to support your work and service in Uganda! The story, and ripples, just never end! This is so ONEderFULLy inspiring, touching, with a touch of humor. Thank you for sharing, Melissa. As seems to always be the case, when we're ready, the universe provides for us what we really need. Double wow! The ripples keep on coming. 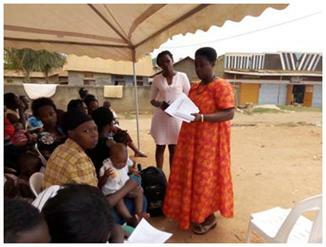 The Pollination Project has a number of close grantees doing fantastic work in Kampala. A few opportunities to mind because of your trip there Melissa. I'll send out a separate email to you in case you want to connect Grace to our fellow changemakers there or you'd like to meet them while you are there. Thank you all so much for all these comments and love. Nipun...I can't even begin to thank the beautiful traveler. It is just the biggest blessing I can ever imagine. As are all of you!!! I love you the size of Africa to infinity! Not to sound too ServiceSpacey Melissa, but this is ultimately a testament to your merits, not magic. Oh my gosh, Gayathri...thank you, thank you for that selfless work transcribing my call. It was an honor of my lifetime to get to share my thoughts, and for you all to unpack that tedious task is such a blessing. Love you! !